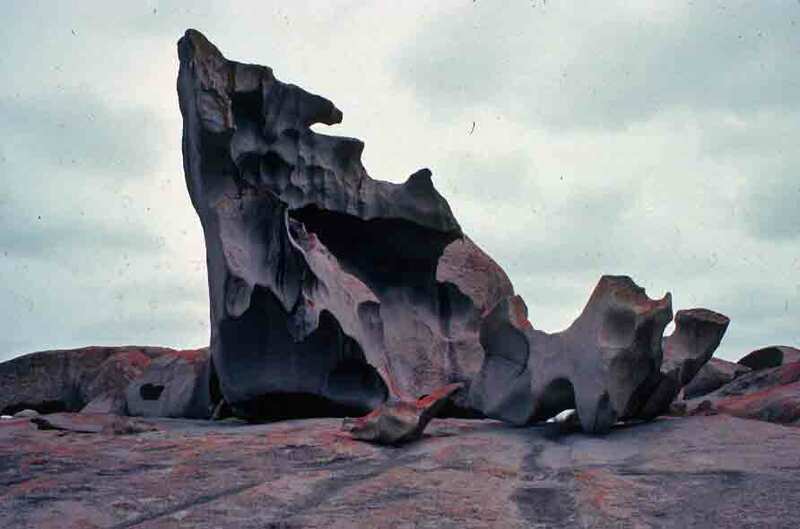 The Remarkable Rocks are not, in fact, the only remarkable rocks on Kangaroo Island. The island as a whole is a patchwork of ancient and noteworthy features. 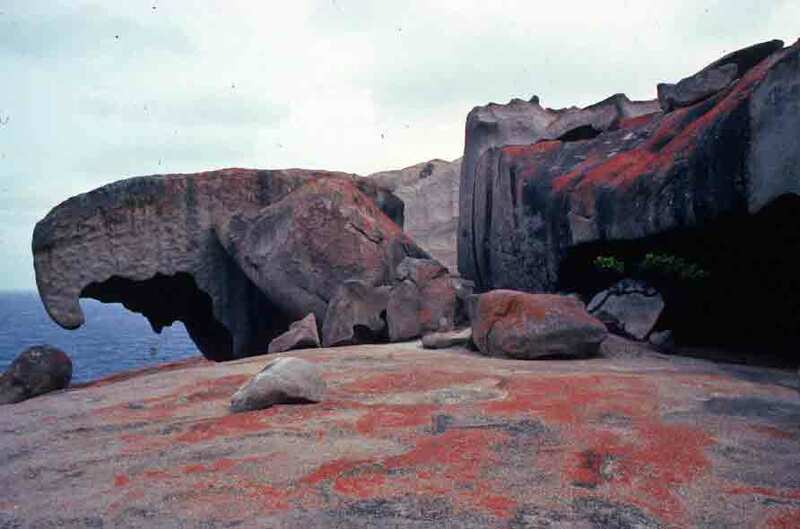 In fact, some of the exposed rocks and outcrops are of such geological significance, they have been designated as “geological monuments.” Of the 27 designated geological monuments on the little island, I saw three: Remarkable Rocks, the fabulous and extensive Kelly Hill Caves, and Admiral’s Arch. These are, however, considered to be among the most fascinatingly picturesque. Admiral’s Arch is not your usual water-carved natural bridge. 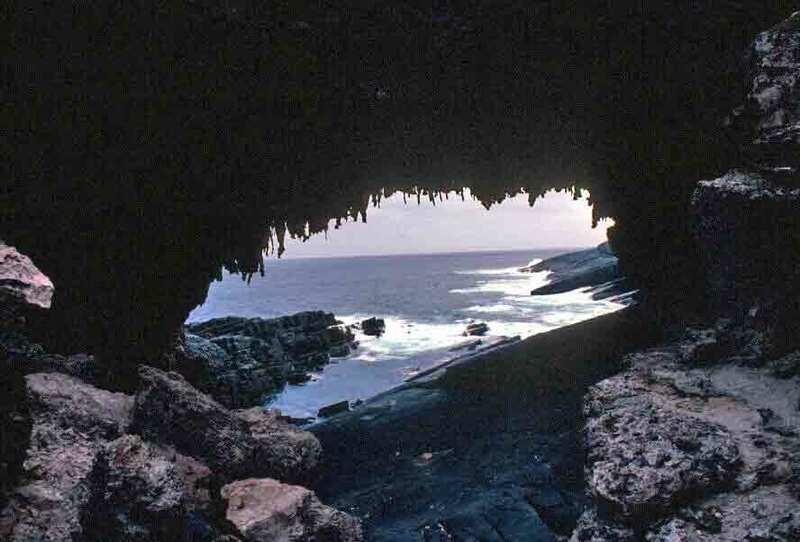 It is, in fact, an ancient cave that has simply been broken into by the waves. Stalactites still cling to the remnant of the cave’s roof. The weather was brooding, which made less than ideal conditions for photography, but seemed to match the dark, haunting, ruined aspect of the exposed cave. I’ve read that a boardwalk and viewing platform have now been added at this site, as much to protect the rocks as the tourists. As a result, while there is a little less adventure involved in seeing the arch, it is much more accessible than when I visited. 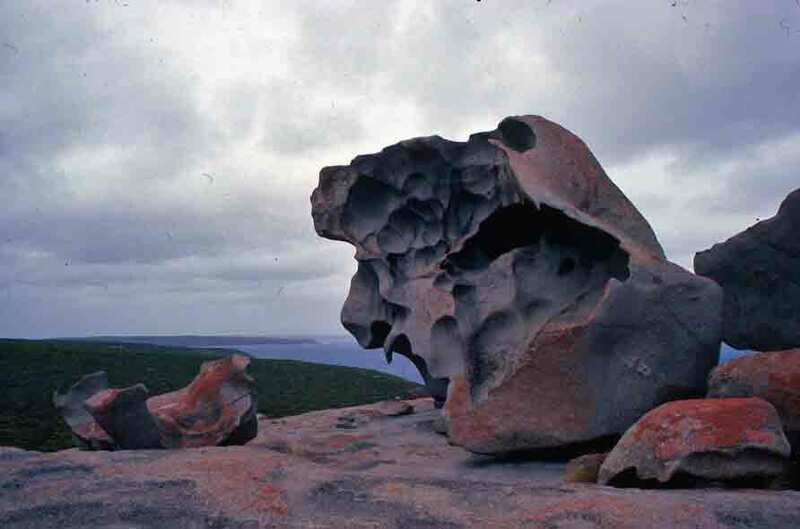 At the southwest corner of Kangaroo Island, on the coast and within the bounds of Flinders Chase National Park, a granite dome rises precipitously from the sea. 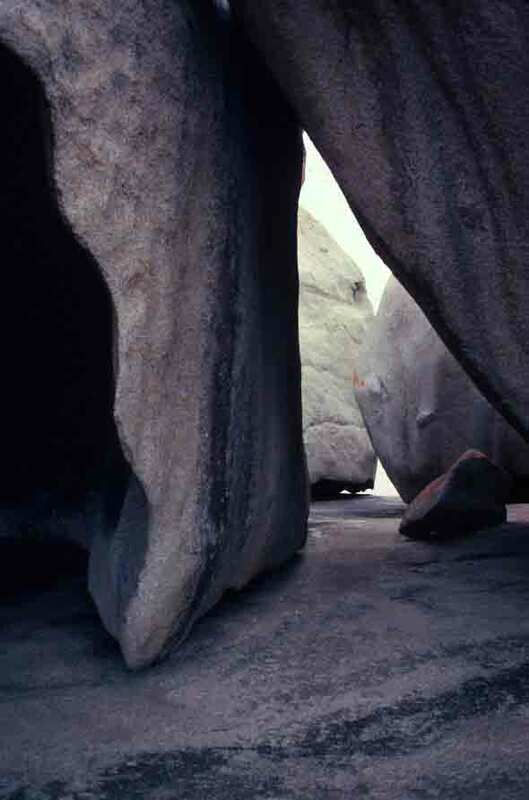 Perched atop that dome is a group of granite boulders that, through long years of exposure to wind and salt spray, have been eroded into the most remarkable shapes—and hence the name, Remarkable Rock. There were abundant emus on Kangaroo Island, though I’ve seen this large, flightless, ostrich-like bird pretty much throughout Australia. 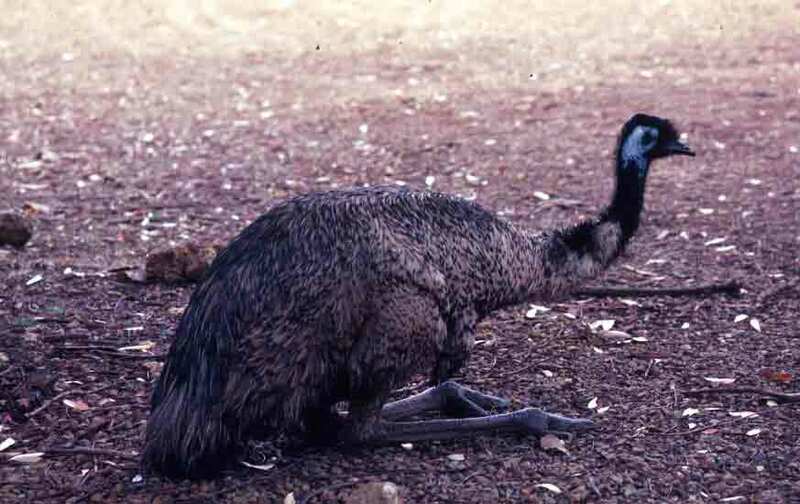 The emu is, in fact, the second largest bird in the world, after the ostrich. It stands more than 5 feet tall and can weigh 100 pounds or more. As you can see in the photo below, the emu has powerful legs. While it can’t fly, it can run at a speed of roughly 30 miles per hour. Of course, those strong legs and big feet can be used in defense, if you corner an emu—so don’t. Most of the emus we saw on Kangaroo Island were hanging out near picnic areas, looking for handouts. In fact, the picnic tables at Flinders Chase, where we stopped for lunch, are surrounded by fences, to protect picnickers. Because while a kangaroo will beg for food, an emu will just take it—and you aren’t going to catch a bird that can run 30 miles per hour. Emus mate for life, and it is the male that sits on the nest. In other parts of Australia, I’ve seen emus with their striped young trotting along with the adults, and while a relative newborn is about the size of a chicken, it still looks small compared to its massive parents. Instead of a song, the emu makes an odd drumming sound, though only during the breeding season. Hence, though I have heard it on several occasions, we did not hear it as we dodged the emus at Flinders Chase. Looking at the bird, you might wonder how I felt about flying Emu Airways en route to Kangaroo Island. Well, I didn’t worry—but it did make me smile. 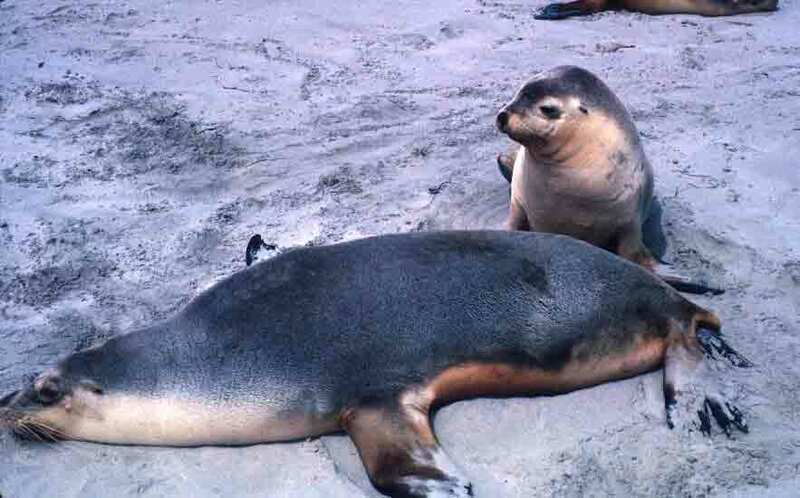 Back in June 2007, I posted about my visit to Seal Bay. That post offers a lengthy excerpt from the book about that visit, so I won’t go into a lot of detail here. However, in that post, I included only a photo of a bull sea lion showing off for us. So I thought that, here, I’d offer a mother and her pup. The pups were getting quite large, but they were still adorable: some nursing, many frolicking, a few napping, but all very cute. Kangaroo Island was turning out to be a real paradise for lovers of wildlife! A short hop in a small, twin-prop airplane carried me from Adelaide to Kangaroo Island, which lies off the coast of South Australia. Because of its isolation from mainland Australia, the island has its own variety of kangaroo. 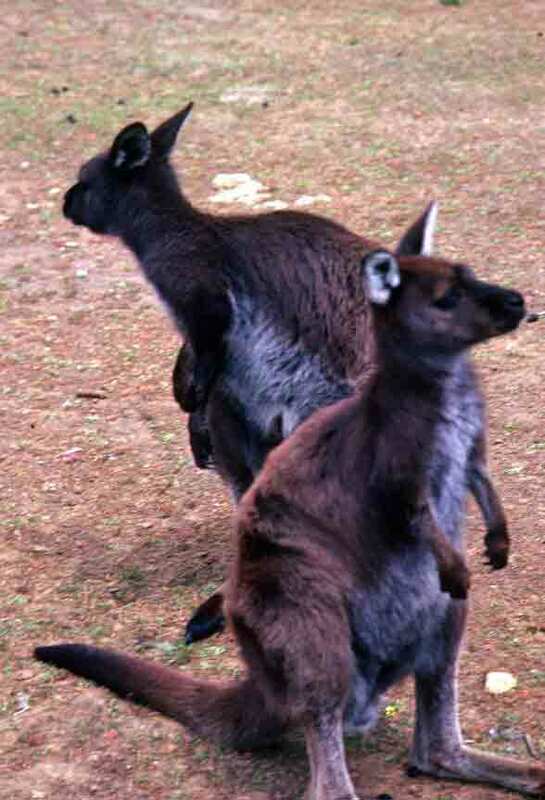 The Kangaroo Island kangaroo is short—about 3 feet tall—and dark brown. They are adorable, curious, and eager for handouts. One of the locals told me they also make faithful pets. In my dreams. Being surrounded by a crowd of these splendid little marsupials was just one of the many delights of Kangaroo Island, but it was a great start.